Sports have a way of bringing people together unlike anything else. In the United States, football is synonymous with the fall. The NFL has one of the most devoted fan bases of any organization in the world. So much that it essentially owns a day of the week! During the season, many people dedicate their Sundays to sitting in front of the TV in their favorite jersey, drinking beer, and eating food fresh off the grill. As great as this tradition is, there’s nothing that compares to actually going to a game. Watching your team play in a stadium atmosphere full of loyal fans is something you will remember for the rest of your life. Here are five NFL stadiums that truly make the football experience something special. Opened in August of 2017, the home of the Atlanta Falcons is about as state-of-the-art as it gets. With an estimated construction cost of $1.6 billion, it’s safe to say they spared no expense in making the stadium awesome. The innovative retractable roof and gigantic circular screen provide clear proof that this establishment is set on pushing boundaries. The facility was designed through the eyes of the fans. At each end zone, there is plenty of open space where patrons can get out of their seats socialize with other like-minded people. For as swanky as this brand new stadium is, concessions are surprisingly reasonable. A couple hotdogs and a beer will only cost you about $12. 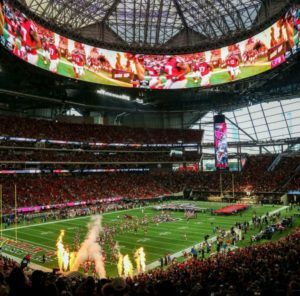 Being as how the Falcons are currently a powerhouse in the NFC, you can expect a crazy energetic atmosphere at Mercedes-Benz Stadium for each game. Home to the Pittsburgh Steelers, Heinz Field represents its team and city down to a tee. The construction of the facility is a nod to Pittsburgh’s notorious no-nonsense persona and industrial history. The pregame parties and tailgates are some of the best in the country. The festivities officially start at Jerome Bettis’ Grille 36 and extend up North Shore Drive with all kinds of bars and restaurants along the way. If you really want to do it right, hop on the Gateway Clipper Riverboat for a landmark-filled cruise right to the stadium! Being as how the field is named after the famous condiment brand, you can expect an elite selection of concessions in the concourse. You have access to local Pennsylvania vendors such as Benkovitz Seafood, Quaker Steak & Lube, and Primanti Brothers. No trip to the “Steel City” is complete without experiencing a game in this exceptional stadium. 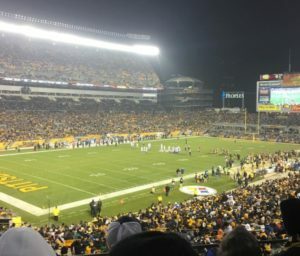 Generally speaking, most Steelers fans are genuinely nice and inviting – being engulfed in a yellow sea of “terrible towels” shouldn’t be too intimidating. When describing AT&T Stadium, home of the Dallas Cowboys, the term “colossal” is the best adjective to use. 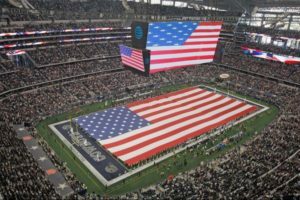 The facility resembles a football theme park and truly embodies the saying “Everything is bigger in Texas.” The 175-foot jumbotron is so big it even influenced the rules of the game! The stadium is built to hold over 100,000 fans, making it one of the largest in the country. Patrons are treated to a plethora of fine art exhibits and homage to the team’s illustrious past. Throughout the extensive concourse, there is no shortage of enticing options for food and drink. The state of Texas is renowned for its dedication to football, and Jerry Jones makes sure this stadium encompasses this concept to the fullest extent. Regardless of where your seats are, you are in for a prestigious experience. Prior to the grand opening of CenturyLink Field in 2002, the Seattle Seahawks were more or less of a competitive afterthought in the NFL. Now, everything is different. The Seahawks are currently one of the most feared teams in the league and have won about 70% of the games played at here. This stadium was strategically designed to be the loudest in the NFL. In turn, making life as the visiting team extremely difficult. 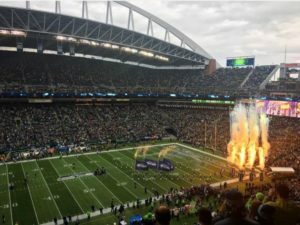 A few decades ago, the audience in Seattle was coined “The 12th Man.” CenturyLink’s construction makes this obvious from the second you set foot inside. The noise gets so loud that some say the players can barely hear the quarterback in the huddle! From mouth-watering seafood to gourmet coffee, the concessions perfectly represent the authentic food and drink options in Seattle. Any game you see at this acclaimed stadium will surely be one of the most intense sporting activities you will ever be a part of. Honestly, has there ever been an article about the coolest NFL stadiums that didn’t mention Lambeau Field? Proud home of the Green Bay Packers, Lambeau Field, located on Lombardi Drive, is far-and-away the most iconic football stadium in the NFL. It is also the oldest continually-running facility in the league. There is nothing else in the world that compares to the feeling of laying eyes on this field for the first time. Given all the intense rivalries and remarkable history, simply attending a game here is paying homage to one of the greatest American traditions. The Green Bay Packers boast the title of being the only publically-owned team in professional sports. That being said, the “owners” have no hesitation in making sure this sports landmark is the absolute best. Game day in Green Bay is something that engulfs the entire city. Over the years, the stadium’s organization has refined itself to be incredibly convenient. The setup is designed so entering and leaving the event is as painless as possible. 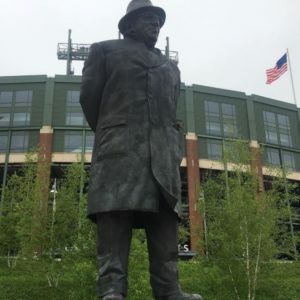 Being that Lambeau Field is placed in the middle of a residential neighborhood, many of the locals will rent out their driveways to visitors during the game so parking is rarely an issue. Concessions here perfectly reflect Wisconsin’s reputation for exquisite food options. 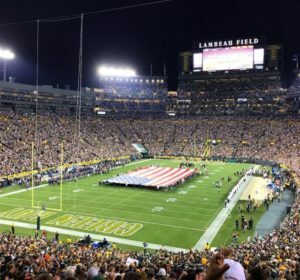 If you consider yourself a true NFL fan, making a trip to “The Frozen Tundra” for a game is something you definitely need to do at least once! Football season is a time many people in the United States live for. There’s nothing quite like experiencing a live game in the crisp fall air! The NFL is home to many glorious stadiums that go beyond this list. Some honorable mentions include Arrowhead Stadium (home of the Kansas City Chiefs), the new U.S Bank Stadium (home of the Minnesota Vikings), and Gillette Stadium (home of the New England Patriots). 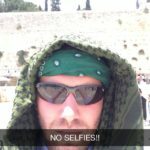 Seeing a NFL game in a place filled with tens of thousands of fellow football fans is something everyone should make an effort to do in their lifetime! A lot of these placed have one thing in common: creature comforts. Not necessarily true fans and a true football experience. And Mile high stadium should be at least an honorable.